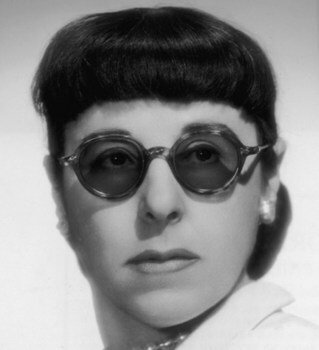 Edith Head was was a costume designer who became a legend. During a career which spanned six decades and some 750 films, she received 35 Academy Award nominations and won a record eight Oscars for Best Costume Design. As well as her Hollywood career she designed for Vogue and appeared regularly on television. She was born on October 28, 1897 in San Bernardino, California with the birth name of Edith Claire Posener. Her father, Max Posener, was a German Jew who emigrated to America in 1876. Her parents divorced when Edith was very young and her mother remarried. The young child was given her stepfather’s surname and became Edith Spare. Edith studied at Los Angeles High School and proved to be an avid pupil with a gift for languages. She went on to University of California, Berkeley and then to Stanford University where, in 1920, she graduated with a Masters degree in Romance languages. She became a French teacher at Bishop's School in La Jolla and after a year moved to a similar position at the Hollywood School for Girls where she also taught art. At this time she had only briefly studied art in high school, but, wanting to improve her drawing skills, she began taking evening classes at the Chouinard Art College. In 1923 Edith answered a classified ad for a sketch artist at Paramount Studios. To back up her application she borrowed sketches done by her friends from the Art College to use as examples of her own work. The stratagem worked. In 1924 Edith began work at Paramount Studios as a costume sketch artist. She had found her true métier. She began a long period of self education about costume design and the Hollywood movie industry, initially designing for silent films, working under Howard Greer for three years. In 1928 she was promoted to design assistant, working for the studio's most innovative and successful designer, Travis Banton. Banton was a brilliant designer who had created the wedding dress for Mary Pickford's marriage to Douglas Fairbanks but he had a serious drinking problem. He was Edith's superior and teacher for a decadel and she owed him a lot. She also covered up for him many times when he was absent through drink. Edith started by designing for secondary, character actresses and gradually Banton asked her to take on the less well known actresses in leading roles. Her first big star was Clara Bow who was not a favorite of Banton as she used to add cheap jewelry to his chic creations. When Banton handed her over to Edith, she and Clara became close friends. Eventually, in 1938, Paramount lost patience with Banton's alcoholism and asked him to leave. Edith was promoted to become the studio's chief designer. She created spectacular designs for most of the top actresses of the day including Marlene Dietrich, Bette Davis, Ginger Rogers, Olivia de Havilland, Barbara Stanwyck, Grace Kelly, Elizabeth Taylor and Audrey Hepburn. Although she had entered the industry almost by chance she seized her opportunity, understood every detail of the business and gave her clients exactly what they wanted. As a result, she remained a favorite among most of the leading female stars of Hollywood for many years and was even "loaned out" by Paramount to other studios at the request of their female stars. She remained at Paramount until 1967 when, at the age of 70, she left to join Universal Pictures. Hollywood by this time had changed in character from Head's preceding years. Many of the actresses whom she had clothed and got to know well were no longer working and the old studio system had disappeared in the face of competition from television. Nevertheless Edith continued her successful ways and received a final Oscar for her work for Paul Newman and Robert Redford in the 1973 hit 'The Sting'. Her last movie project was the Steve Martin comedy 'Dead Men Don't Wear Plaid' in 1982. One of Edith's proudest projects came during the late 1970's when she was asked to design a uniform for the female employees of the United States Coast Guard, because of the increasing number of women in the service. She felt that the assignment was a highlight of her career and she received the Meritorious Public Service Award for her efforts. Edith chose, probably wisely, not to try to compete with her glamorous female clientele. She became known for her plain dress style, wearing very conservative business suits and thick-framed glasses beneath a severe haircut. She married twice, firstly in 1923 to Charles Head, the brother of one of her art school classmates, thus changing her name to the one we know today. She chose not to change it when the marriage ended in divorce in 1936 after several years of separation.Her second marriage was in 1940 to her good friend, Wiard Boppo Ihnen, a set designer at Paramount. They remained together until his death in 1979. Edith wrote two best-selling books, 'The Dress Doctor' in 1959 and 'How To Dress For Success' in 1967. Both books still sell well today. During her life Edith was nominated for Oscars an extraordinary 35 times and won the Award on a record eight occasions. She had a close relationship with the Academy and it is believed that she lobbied hard for the Academy to include a Best Costume category. When it was finally included in 1948, she began winning Oscars regularly, starting with 2 in 1949 and continuing in 1950, 1951, 1953 and 1954. She won again in 1960 and finished off in the modern era with an Award for 'The Sting' in 1973. Between 1948 and 1967 (apart from 1957 and 1958) Costume Design Oscars were given separately for black and white movies and color movies.